The first ship built in the Polish shipyard after the Second World War. Bulit in Gdansk Shipyard, it was a vessel with an unprecedented riveted welded construction, that served under the Polish flag from 1949 to 1980. During 1479 cruises the ship carried over 3.5 million tons of goods, mainly coal and iron ore, to more than 60 ports. 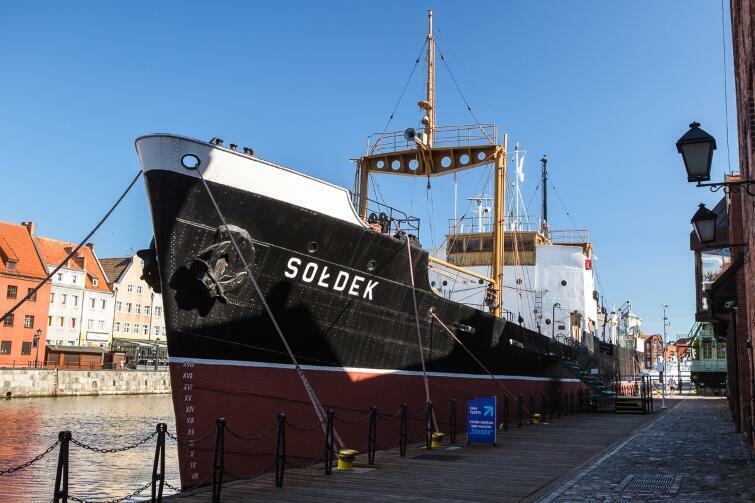 At the end of 1980 "Sołdek" was withdrawn from service in Polish Maritime Navigation and has been a ship-museum since 1985. While Visiting "Sołdek" you can learn almost all areas of the historic ship: engine room, officers and sailors cabin and the bridge. Tourist Card: FREE ENTRANCE with Family Fun Package and Sightseeing Package. Will I receive a discount with the Gdansk Tourist Card? With Tourist Card Family Fun Package and Sightseeing Package you get free entracne. Is there a car park near Sołdek? How long does it take to visit Soldek? Is the facility accessible for the disabled? The possibility to experience selected exhibits through touching available for organized groups of visually impaired or blind people under the care of the NMM educator's (upon reservation).